Does Sprint really expect someone might want (need?!) to pay millions for their phone bill? Only took me 5 years, three copies of the game, four different tvs/displays including my new tv that died after 2 weeks, and three restarts with the latest being 84 hours of play time! Geez! Now I need to beat FF7 which I first got for the PC (like with FF8) but never beat (but got close) because I played it too fast. This time I'm going to play some other games before I start with FF7 incase something else comes up. It would be nice to beat it before Avent Children comes out in the US so I know what's going on. My parents are going to have some visiters over next week including a 2 year old girl and 5 year old boy. Mom asked if I can look for some computer games for them to play (along with borrowing my PS2). Since I don't have any windows kids programs I started asking around and looking for online kids games. 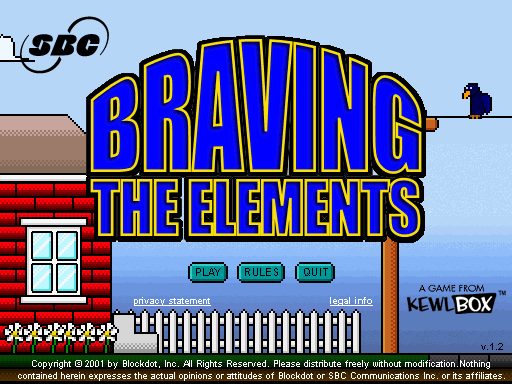 I ran into one game on FunSchool's website called Braving the Elements, a game sponsered by SBC. "The object of this game is to navigate Bob from his house to the mailbox so he can mail his bills. You must collect a certain number of gold stamps each round before reaching the mailbox, or you will be sent back." I'm slowly moving down to my parents basement and to help with planning I started creating 3d layouts of the basement, partly do I don't have to move furnature around a lot to see what fits and mostly because it's cool. I "finished" my Computer room/Halfdone Office. It's all to scale (it's about 12' by 9') and the furnature and some of the computer stuff. The computer to the left is Pacman, which runs the whole Halfdone.com domain, the system to it's right is Megaman which is my main workstation. The program I was using, DesignWorkshop Lite, only allows 100 objects which I just hit with this room so I didn't get to put the laptops or the lcd I have mounted on the wall...etc. 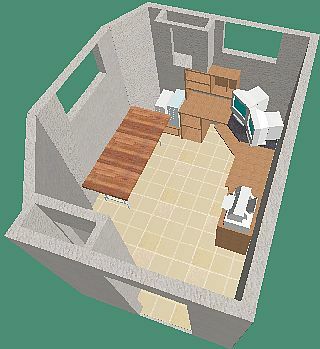 Anyone have any suggestions on a good program for 3d home design? Free would be the best. Either way, more rooms to follow. I setup a Choose Your Location webpage because all the cool websites have one. So what if there is only one location in Boston. Something that I haven't thought of in many years that I use to "build" as a kid was Computer Magic. Where I would setup a computer cluster without even knowing that term! When I was small and I got in trouble, usually fighting with my brother, mom would send both of us to the corner (different corners ofcourse). We did lots of stuff in this corners, from making easter bunnys out of the paper money collection box that Sunday school gave out to help collect money for the church noone ever used, to, blah, homework. One thing I did a few times was Computer Magic. I would take all the electronic stuff I can reach like my Speak'n'Spell, radios, the fake computer that did math and spelling (don't recall the name) and all the kinda wires I had including headphone jack jumpers and spare wire from my dad's Rabbit kit for the tv...etc. I would collect all these devices and try to connect the wires between them. Some devices had jacks so I would use that but if not I would stuff the wire in the battery conpartment or in vent holes. I would then pretend I would have the most powerfull computer in the world or something like that. All this was before owned or even really got into computers like I am now. At this point I was likely only used the school's Apple IIs playing Number Munchers, Oregon Trails and Where in the World is Carmen Sandiego. Sorry I got behind in my SOTW, went to my cuz's baby christianing and semi moved. I'll just put a link to a site I ran into at Cockeyed.com. Check out the How Much is Inside and Pranks sections, I might want to pull some of my own pranks like that. 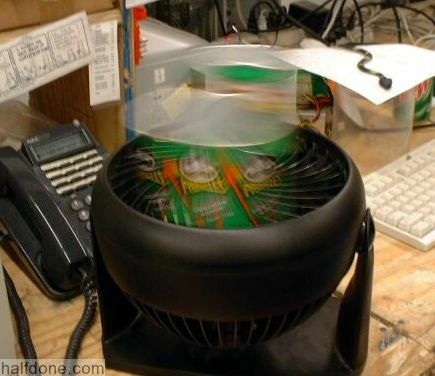 Ever poured salt into a running harddrive? I think I know what it is like to be insane without actually being insane (although some of my friends would disagree on that last part). You hear sounds coming from ordinary objects like soda cans, unplugged speakers and ovens but you can't stop it. I've cut speaker cords, shredded cans and more and it doesn't stop, it makes you scream and want to curl into a ball. In the past I use to use a normal alarm clock but it would be too quiet and never notice it or I would keep hitting snooze over and over. I even went as far as jamming the snooze button but then I would learn to hit the off button. Even jamming the off button wouldn't help much. Currently I use my computer as my alarm clock which plays this loud "Wake Up!" wave file. This way I have adjustable volume control and very flexible scheduling. I wrote a quick program that just shows a big "WAKE UP!!!" window and I have to close this program to stop it. I have to login in order to do this helping me wake up. As long as I don't turn off the speakers (which I've now trained myself not to do) it works great. Because this program is designed to run for 1 hour before turning off automatically and I have alarms set at different times including every half hour in some cases, causing it to play this wave over itself two or three times, which being asleep sounds very weird and different. There have been lots of times that my alarm clock has been made part of my dreams before I wake up. It's a different sound every time, either someone screaming my name or someone else's or just plain loud noises. Lots of times it's embodied into some sort of object like a soda cans. Since I'm asleep and don't know it, there is no way I can stop the sound until I wake up, not that I haven't tried. 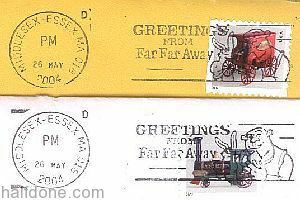 Since when did the US Postal service use Ads for rubber cancel stamps? I think I see enough Shrek2 items already. 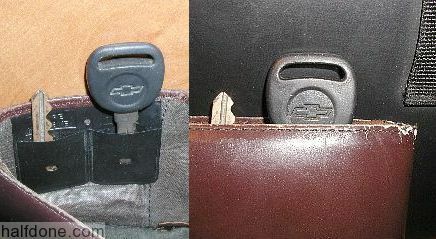 Have you noticed the spare key holders that wallets got? It's a nice idea to make a nice holder for a car key but it's just too small! They got lots of space under it why not make it full length or atleast leave the bottom open? Even if I gab the key though the odd hole they make in the center it still doesn't fit all the way. I needed to put something up on my mostly bare walls. I've been looking for good computer related posters but they really only have stuff like Internet maps and others. 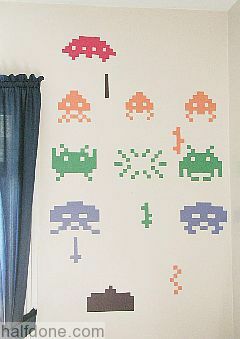 Looking around I found this item on Think Geek, the Space Invaders Surface/Wall Graphics. Now I think this is a GREAT idea. At $45 USD I didn't want to pick it up but I can make my own and make it better! First I was planing to print them out but I think I would have spent over $45 for ink anyway. So I stopped by the local CVS and picked up a pack of multicolored contruction paper for $5 bucks. I then found screen shots of the game online and created scale diagrams of the original aliens, ships, bullets and others in Dia. Here is a copy of the dia file. I then printed the outlines onto the constuction paper, cut them out and used lots of tape to keep the "pixels" together where needed. 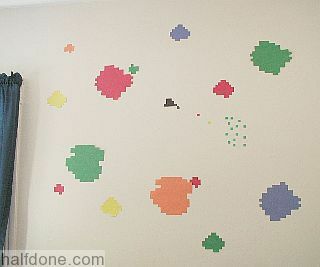 Next I'm going to put up Asteroids on another wall. The asteroids version is done, much easier to do then the space invaders since there isn't too many loose pixels. For the blowing up asteroid I first attempted to take up the pixels on a grid like I did for the other one but there is too much of a gap between them. I ended up cheating and printed it on transparent film. Here is the dia file for this one. I still have more space above my bookcases I might put pacman or something like that there. I wasn't that big of a pacman fan though, never had the game for the atari 2600. My better Mindstorm Line Follower. Ever play with MS Agents? The animated talking characters. The way they say some stuff is funny. My favorate so far is fooooooooooooo. Now you try to do that! Would someone at Microsoft stop using "Messager" for a name?? MS has at least three different products with that name. Messager the fax software that came with Windows 95, a Service level program that comes with WinNT-2k-XP-03, and the Instant Messager service. While the original fax software isn't used anymore, they still leaves two other ones both which comes with Windows XP. 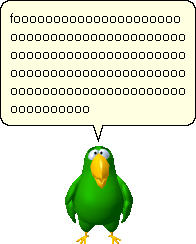 It doesn't help that in previous version of windows the IM client was called "MSN Messager" but for some reason under XP they call it "Windows Messager". The information we collect when you visit our shop include but not limited to all hair removed due to the cutting process, any cell DNA, mitochondria DNA and dandruff, date/time of the visit, payment options and tips (if any) given. We use this information to measure the number of visitors and help us make our lab results and your visit quick and pleasant. We may share such information with partners, advertisers, bio-pharmaceuticals and others but only in aggregate form, not in a manner that would allow personal identification of a specific user, at least before the cloning is complete. If you visit our shop and make requests, register to receive materials, apply for employment, or participate in our reminder services, the types of information collected are the following: your name, your address, your e-mail address, your phone number, your blood type, your genealogy and any other information we were able to get. If you participate in a survey or questionnaire, any information we got will also be maintained forever. From time to time, we may send offers and/or information, usually after failure in lab results, to you. We only share personally identifiable information provided by you with third parties with your permission or large cash incentives. We always provide you an opportunity to opt-out, prohibiting any further sharing of your information (except when we believe the law requires us to disclose it or when the disclosure is necessary to make us money). No information taken or removed from Children 13 and under except if the floor sweeper got lazy. Ok when did this start happening? I want my Royal Pine Green Car Tree back! Fluffy, my cat, has Acne... Acne! Cats have acne?? Now if we used the one year is seven dog/cat years pseudo rule, my cat would be 42 years old. A 42 year old with acne. Of course once I found out it was acne by the vet, I started looking it up on google. Like me everyone else they were surprised cats have acne too. You can see what it looks like here. Now for the people who never owned a cat you might be a bit surprised that they do sneeze but when you think about it you realize, why not? But acne? To bad I have a female cat, if it was male I might give it some soda or beer and see if they burp too. 621 Lanuages of 99 Bottles of Beer Song (in programming of course). Some programmers must be really bored to think up and actually create working languages like Cow, Beatnik, and BrainF*. I just wanted to leave you a quick note saying I'm sorry to find out your sick and hope you get well soon. I took your bus yesterday and instead of the usual hold on tight, flying past bus stops, record breaking 6 minute trip from work to home you took a slow 15 minute speed limit ride. Is it the mouse cursor's way to show that it wants to get out more? Not wanting to be stuck at home or work doing boring stuff like documents? What if we let the mouse cursor free? 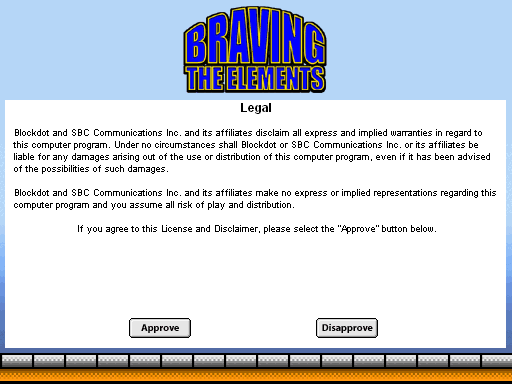 Another one of those silly flash games found on the net. The original site I found out about at http://junk.dawnshadow.se/yp010.swf appears to be down but I found another site http://www.damell.net/yp010.swf. 321.1 is my top score so far. Both links are now down but seems like there is a new website with a version that includes an online highscore tracker at http://yeti.e-medien.com. 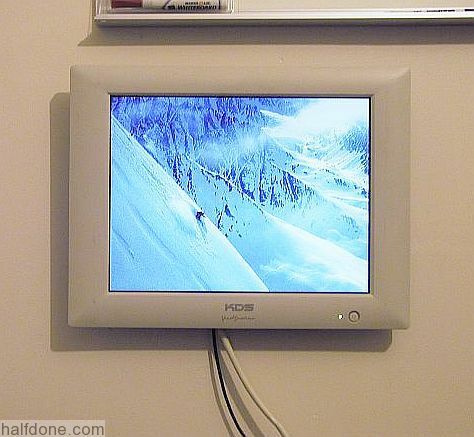 I got an old LCD monitor from work mounted on my wall. They had a really old KDS 14" LCD display at work that was dead. I took it home just to find out the power brick had a blown 1000uf 25v Cap which was quite easy to fix. The LCD itself is horrible but I plan to just use it as a test monitor on my home work bench. Originally I just removed the stand and drilled a hole in the back and put it on a nail. The problem was with this monitor it had a curved back causing the display to stick out more then 6" from the wall. 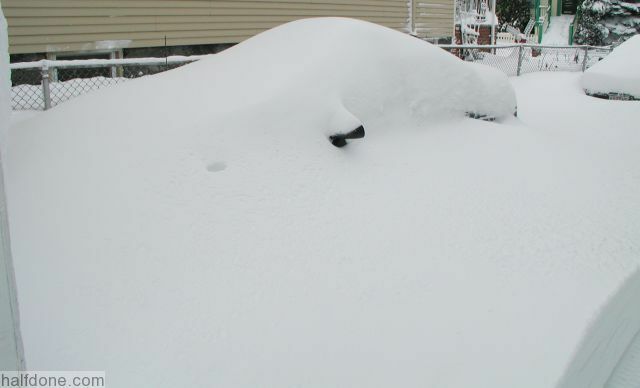 If you open it up you would see that about 5" of that was just dead space. I got some lexan we had around, removed the plastic back cover from the lcd, and mounted the lexan with small washers to give it some space. Put on a normal picture frame bracket and hung it on the wall. Another thing I also did was rewire the power connector. 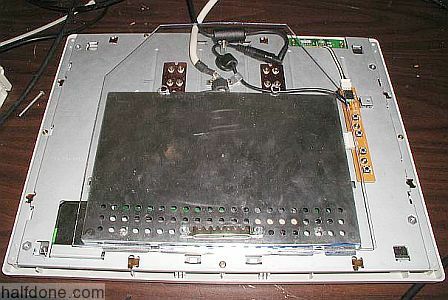 This LCD had the power down the VGA cable. While I'm sure it was great for normal use but was a huge pain for testing since I have to tie wrap the power cord to the outside of the vga cable so I don't have another cable to run to the test computer. Using a multimeter I found the power wires, very thin too, something like 24 gauge. Found where it connects to a pcb, got out the sodering iron and cut the power cable. I wired it directly and now works great. I have since wrapped the black power cord for a short length with masking tape to better match my wall color. I had jury duty back on the 9th of December, and it's the first time I've ever had it but it's not that bad, mostly you wait, and wait, and wait... If you ever do it make sure you take a book or something. Massachusetts has a "one day, one trial" thing where if your not chosen to be on any jury for that day your all set for 3 years, which is what happened to me. I got my notice several months before saying I have to show up on Dec 9th or get a $2000 penalty...etc. Oh fun. If I postponed that date I would have to go to courthouse some 20 miles away, instead of the courthouse 1.5 blocks from work. Not that I wanted to avoid it anyway, who cares about work. I was on Panel 8, Seat 15. A few days before, I got a reminder notice, it also said I was a Standby Juror, meaning I have to call after 3pm the day before to see if I'm needed. I called and they called in everyone. So I show up 8am, pass thru the metal detectors (I was prepared this time for that, brought minimal stuff, I'm a pack rat), and went to the 5th floor of the courthouse, sign in and sit for about an hour reading another Star Trek book. At 9am they showed us a orientation video on how it works and such. Then we went for breakfast, they have a cafeteria on the 3rd floor. They also warned us that if we don't show up and our panel is call you will be marked as not present and have to start over or possible $2000...etc. Had a quick breakfast then stayed in the Jury Pool, which is a room or two where you wait all day (literally) and there is no pool tables or swimming pools. At about 11am they call panels 1,2,4,8 (something like that, about 40-50 people) to line up in the hall. They do a roll call then we all went to the 7th floor and into one of the court rooms. It's a nice room, completely round, smaller then I expected I guess. Looks like they have two courtrooms per floor. We sit or stand in the area where the audience would be and we give the usual oath and ask you questions like do you know the lawyers, plaintiff, defendant, about the case...etc and if you do you raise your hand and they take down your panel/seat number. I had no reason to say otherwise so I never raised my hand. Then they started with jury 1-1 (panel1, seat1) to sit in the jury section to the left. And they keep going, in order (don't know if that is typical), until they fill all 16 seats. When they call a juror to sit in a juror seat and that person said yes on one of the questions they get called the to Sidebar to the judges left and they explain why to the judge and the lawyers in private. If the judge is ok with the reason they say "Juror blah-blah is excused by the court" and they go back to the jury pool room. After they have 16 people selected they then play musical chairs. The lawyers and judge have a huddle and they remove people they don't like from the seats. Then they pick more jurors then start again. I can see why they need 50 people just to get 16 :) They go through panels 1,2,4 and part of 8 but didn't get as far as me as 8-15. Once it was all done the rest of us went back to the pool room and played 9ball and took a quick swim. Chase ads in your statements. Ever happen to you? You are decorating the Christmas Tree and a ball falls off and shatters. Happen to you a lot? Cat likes to play with the ornaments? Now introducing the Xmas Tree Net! 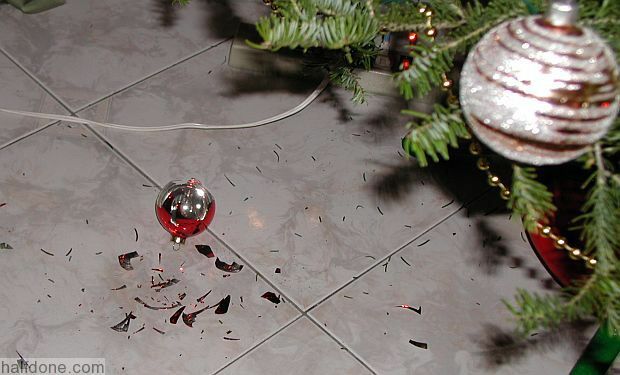 Easy to install net placed under the tree designed to catch any of those fallen ornaments and to keep the cat away. Now in Pine Green and blends in well. Ever noticed that XP's Rover the search dog reads backwards? I guess they forgot to localize it for my English (US) version. I'm getting behind in my updates again. Since I had to fix it anyway, why don't I explain how I fixed some reindeer yard ornaments? Here are some details about my Megaman Case Mod. 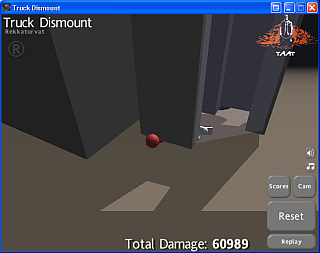 I found out this game called Truck Dismount. The goal is to create as much damage to the little guy as possible. So far the most I was able to get was 60101 "normal" where he just bounces around in the truck for a while, and 90508 "cheat." If you look at the top scores you can see 200,000+ points, likely by getting the guys head stuck in the windshield. While I yet to be able to do that (although other parts I can) I got 90508 when the truck tried to sever the guys head. He has some strong neck! I had an idea to post but I forgot what it was already. For us USA guys, today's the last day to sign up for the National Do Not Call Registry! Running kinda late but here is a quick link. When I was using my Tandy 1000Hx 14.7Mhz 8088 computer I use to play this game with my friend all the time. And over the years we use the original dos version of the game to compare how fast our computers were by how fast the game ram. New server is now up, I'll use that as a reason I haven't been updating this. Yeah, sounds good. When I was 16 or so and I had a job at the local supermarket and didn't allow for beards. Being who I am, I usually was running late and I didn't leave enough time for me to shave at home. I took my electric shaver and blindly used it while getting a ride to work from my parents. With my current job I take the bus to work. My current job is more lenient toward shaving, at least until they read this, so if I didn't give myself enough time I just wouldn't shave. But I would think what would happen if I tried to shave on the bus? Someone has ripped my Unknown Devices. Read more. Darn! I missed another one. Still working on the new server install, so here are some links so I don't take too much time on this and get back to work. How about links too all the comics I currently check on a regular basis.. I have several more comics I need to check out but I'm like to read the whole archive from the beginning, which can take days. Some of the funniest parts of Final Fantasy 9. I'm reading yet another of my Star Trek books, this one being about the Eugenics Wars. On page 364 on the second book ("The Rise and Fall of Khan Noonien Singh") they made a crack at Windows. Page last modified: June 27th, 2007 - 5:48pm Boston, USA time. 5,223,010 Hits on this page since July 20th, 2003. Page loaded in 0.003 seconds.